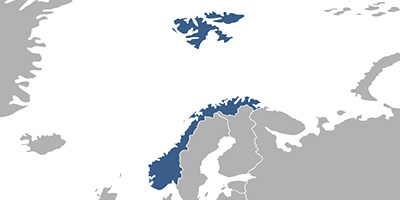 Norway, officially the Kingdom of Norway, is a Scandinavian unitary constitutional monarchy. Norway has a total area of 385,252 square kilometres (148,747 sq mi) and a population of about 5 million. It is the second least densely populated country in Europe. The country shares a long border with Sweden, Finland, and Russia to the Northeast, and the Skagerrak Strait across from Denmark to the South. It shares maritime borders with Russia by the Barents Sea; Greenland, the Faroe Islands and Iceland by the Norwegian Sea; and Sweden, and the United Kingdom by the North Sea. The capital city and the largest with the highest population at almost 1 million is Oslo. Fees associated with registration of IP rights in Norway are available in the fee calculator.